Do you know the knowledge of OTDR Testing? ← How to Find Right Compatible Optical Transceivers For Your Needs? If you are a fiber optic cable (FOC) technician or plants installer, you may be very familiar with Optical Time Domain Reflectometer (OTDR). 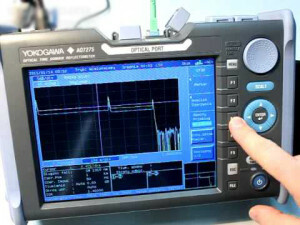 OTDR testing creates a snapshot of a fiber optic cable. This test is commonly used to verify the quality of the installation and troubleshoot problems. OTDR testing requires interpretation of the data acquired, called the trace or signature, by a skilled operator. No matter you are a beginner or a workflow expert, you should master the basic operation skills and considerations of OTDR to ensure the accuracy and correctness of the test result. This paper is a basic guide of fiber optic cable plants testing with OTDR. a. If you are only testing for length, you only need a launch reference cable. The receive cable allows you to measure loss of the final connector on the cable.b. Reference cables must be long enough for the OTDR’s initial test pulse to settle down back to the baseline.c. Connectors on the launch and receive cables must be in good condition (low loss) to properly test connectors on the cable under test. Turn on OTDR and allow time to warm-up. Attach launch reference cable to OTDR and to cable plant under test. Attach optional receive cable to far end of cable under test. Note: Most OTDRs have an “auto test” function, but these functions are not foolproof. Most problems with OTDR tests occur when untrained users use the autotest function without having an understanding of how the instrument works, what a good trace looks like and, most inportantly, what are the characteristics of the cable plant they are testing (length, number and locations of splices and connectors). 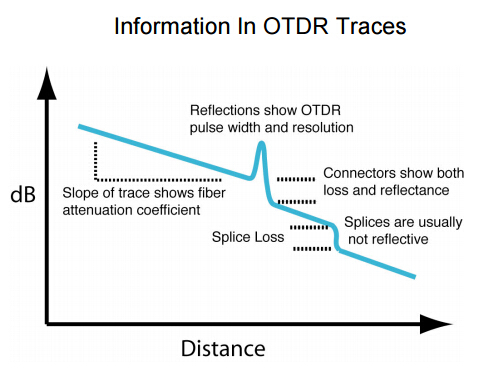 Refer to the next section on reading OTDR traces. Once you are confident that the autotest function is giving valid results, it is a major timesaver in OTDR testing. Testing at more than one wavelength may be required. Longer wavelength testing is often used to find stress related to installation problems. Traces may be compared for analysis. Record the date of the test, operator, test equipment used, cable and fiber identification, test wavelength(s) and all traces for the fiber under test. Insertion loss testing of the cable plant is recommended for acceptance testing. Not all cable plants are long enough for OTDR testing. Ensure the OTDR has sufficient resolution for the cables being tested. Always use a launch cable long enough to allow the OTDR to recover from test pulse overload and permit proper testing of the cable plant. Do not use the OTDR automatic cable analysis until a skilled technician analyzes a trace and confirms it is appropriate for the cable plant under test. This entry was posted in Fiber Optic Testers, Fiber Testers & Tools and tagged fiber optic cable plants, optical time domain reflectometer, OTDR. Bookmark the permalink.